Sarah Bettey Photography: Ladybug out early! My goodness you certainly have a photographer's eye to see that ladybug out early. I hope that drop of water isn't too heavy. Nice job! Amazing capture! I love the refraction! Thanks for sharing! What an excellent photo, I love it! The drop on his back - what a cool shot. Good stuff! What a fantastic capture! I love it! You do have such a great eye! Does look as though he's carrying a load, doesn't it! Wonderful photo, amazing the raindrop stayed balanced on its back. Nice ladybird pic. Still midwinter here and I will not one for months yet. I always look out for them, had a soft spot since I was a small boy. It is early, too early for here. Great sighting and photo. haha... Oh what an amazing picture! Love it!! this is such a wonderful photo. 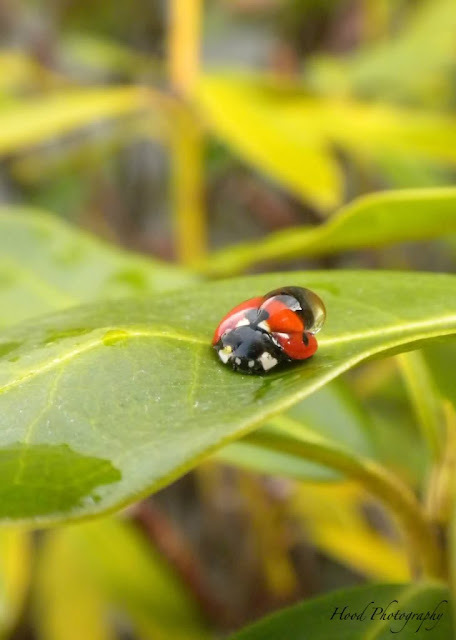 How fun to find a drop of water on a lady bug! Wow! What a great shot! How amazing to catch the water drop on his back. What a capture this is! First, to see the lady but and then to see the water drop too...Wow! Fabulous capture!